RP3614 is rated 3.8 out of 5 by 6. Rated 5 out of 5 by Wizeguy from WORKS GREAT WITH ONE EXCEPTION My Kitchen Faucet (model 174) was constantly leaking at the end of the spout, even after replacing the ball and seats/springs TWICE. I contacted Delta and they sent me this kit (RP3614A) and an aerator and the leak is finally gone - YEAH, THANK YOU DELTA! A couple things to note: 1) Definitely remove the white adjusting ring on the top of the cap assembly before removing the cap. This kit won't work without removing the ring. 2) The two o-rings supplied in the kit are too big for the spout. They are approx 4cm OD and the o-rings in my spout are approx. 3cm OD. Not a big deal since my spout didn't leak at the base. Rated 1 out of 5 by lefty631 from Leaks worse after than before. After installing kits rp3614a and rp70, the single handle bathroom faucet leaked worse than before from around the faucet. So I replaced the new gray cam with the old white cam and washer, and that fixed the leak. What gives with the new gray part? Otherwise great customer service. Rated 5 out of 5 by jpcjf from Exactly what I needed. I installed the repair kit and the faucet functions like brand new. But I now know I need reading glasses, the directions are in very small print, if you need to follow them. Rated 5 out of 5 by Dm14 from Quick & Exact Title sez it. No problem ordering and receiving what I needed. Rated 5 out of 5 by wmmsc from RP3614 It's great that delta still makes parts for the older model faucets. They fit and they work! Does the repair kit RP3614 include parts that can repair the diverter on the spout? The color of the whole set of fixture is no longer available from Delta. I want to keep the matching spout, and not replacing it, if I can. The spout was installed 34 years ago. Thank you for your question. If your tub spout is leaking, the only way to repair it is to replace it. The tub spout does not break down into parts that can be replaced. All my faucets are from 1993 when home was built. Single Handle Kitchen (probably Model 300) looks like RP61 cam is used for repair with RP70 ball. For the single handle (Acrylic Knob) bathroom faucets and shower faucets it looks like cam is RP188. All my older faucets have the white plastic adjusting ring on the chrome bonnet/cap. Not clear in kit instructions... but I'm being told that with newer cams such as RP61 and RP188 that the white plastic adjusting ring should be discarded, even if using the ORIGINAL serrated (no wrench flats) bonnet. If using RP50 replacement bonnet, also discard adjusting ring. Newer RP1050 replacement bonnet doesn't have/need the adjusting ring.. So is it true that adjusting ring should be discarded? When re-inserting the Ball into the Faucet body ( My faucet is Model 502 Single Handle Delta faucet using RP188 Cam Assembly ) ----Is there a PIN inside the Value Body that you need to match up with a Slot in the RP212 Ball? Was I sent the correct part from Delta? I received part numbers RP70 and RP3614A to fix my leaky faucet (slow drip from spout). My instruction sheet from the purchase of my faucet, model 174SSWF, indicates the part numbers are RP70 and KP4993 for this fix. Just wanted to be sure I have the right part before beginning the repairs. Will this work with my Delta 400 kitchen sigle-handle faucet? 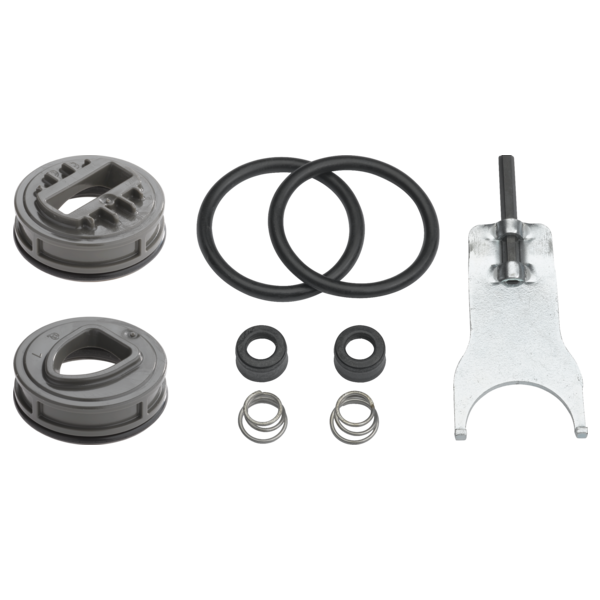 is there a video on how to install a delta leland faucet repair kit RP3614A?